Garlock HIGH-TEMP 9850 Carbon fiber/graphite flake with high-temperature fillers and a nitrile (NBR) binder. 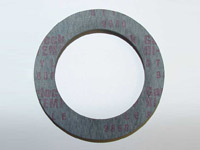 A high temperature gasket sheet of carbon fibers/graphite flake and a nitrile binder that is used for high-temperature aliphatic hydrocarbon service. Carbon fiber gasketing excels in harshest conditions - intense heat, high pressure, saturated steam* and hot oils.